When we caught up with Mike and Vic back in April in Kathmandu, Nepal, we’d casually thrown the idea around that we should all meet up in Sri Lanka for awesome, fun, team travelling times. And, on Friday, 15 May 2015 that idea became a reality. Michael and I had spent the previous night in an airport hotel in Kuala Lumpur, while Mike and Vic, who arrived much later than us, spent the night on the floor of KLIA2. Backpaccking is so glamerous don’t you know? New airport = new carpet. They said they’d had a pretty good night all things considered. Team Sri Lanka are go! We flew on Air Asia, arrived in Colombo, bought a few bottles of duty free and got a van into Colombo Fort where we set off on foot to find a hotel. Piece of piss. There were hotels everywhere – we could see them. They had signs that said ‘Hotel’. Heaps of places to stay. 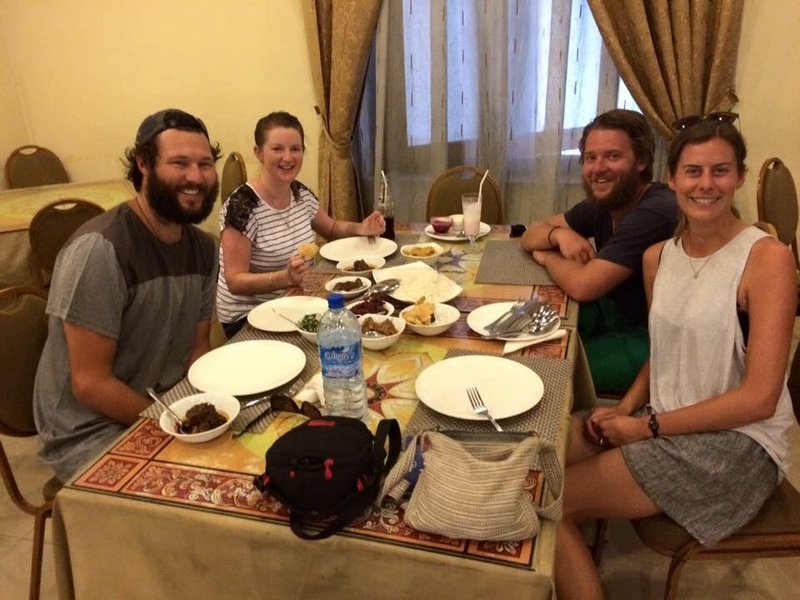 We’re walking, walking, packs on, hot, sweaty, hot, then I spot the perfect place for us – Hotel Spicy. What a name. Sold. Problem. No rooms. Only food. Hotels are not hotels. Hotels are restaurants. Ermalord. Colombo – the city that is more modern and cleaner than expected. Is that rude to say? I’m not sure. But it be the truth. I was impressed. We only spent one day and night here so it was a bit of a whirl wind introduction to Sri Lanka, getting used to the local food, buying train tickets and dining at a cricket themed restaurant aptly named ‘The Cricket Club’ – what will they think of next! 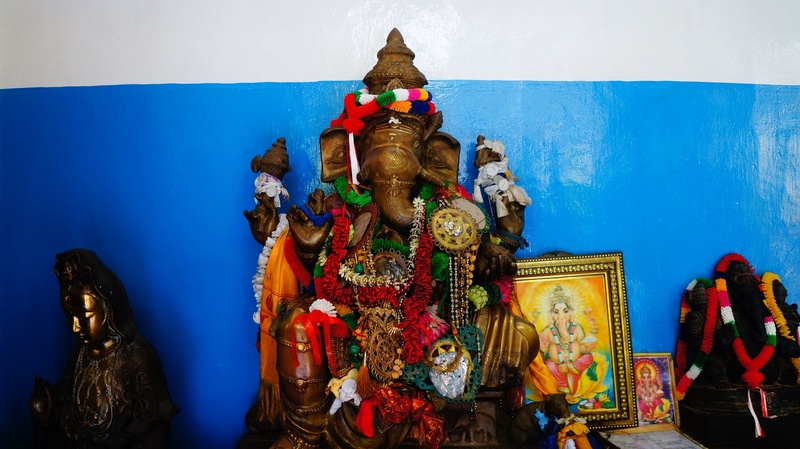 We booked our Colombo – Kandy train ticket on the morning of the day of travel and with a few hours to spare, we somewhat naively took the advice of a man wearing a few too many gemstone and gold rings to take a tuk tuk to a festival, temple and a gemstone museum. There was no festival and the gemstone museum was a gemstone shop where clearly someone was getting commission for any purchases. The Gangaramaya Temple however was real and quite interesting. Full of hundreds and hundreds of donated items, in parts the temple seems more like an antique shop. The floors and walls all had something a little interesting carved into them, and there were two statues of happy dogs! Buddha was the main attraction with BUDDHA, BUDDHA, BUDDHA, BUDDHA – BUDDHA EVERYWHERE. We even saw the worlds tiniest Buddha statue. Here’s Vic checking his belly out. I don’t know if you can see the tiny Buddha in this photo, you might have to enlarge it. He’s sitting on the white thing int he glass globe. It was very small and very impressive. Our tuk tuk adventure came to a halt near the beach. The beach was windy, wild and hot. They type of hot where your hair sticks to your face and even if you went swimming it probably wouldn’t make you feel any better. It’s not a swimming beach, unless you’re craving death by rock. We had snacks, I bought some giant blowing bubbles perfect for the windy conditions and we strolled our way back to the YMCA to pick up our bags. With spare time before our train we decided to get a beer. Like finding a hotel, what seems like a simple task, is not. In the end, a friendly man from the street led us across the road and up a dark stair case which opened up into a dimly lit bar. Photo from the lovely Vic. 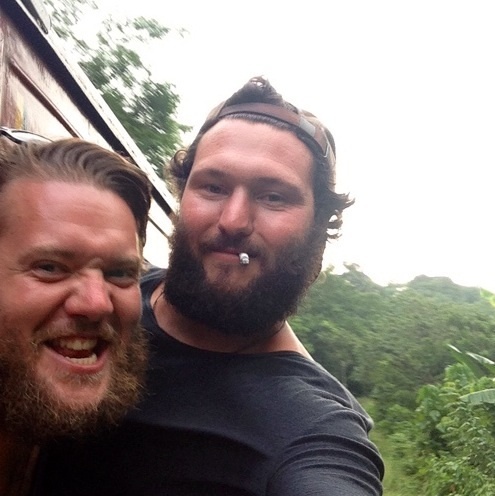 We shouted old mate a beer then made our way to the train station. We rode in the first class carriage Colombo – Kandy. Boys up the front, girls down the back. The girls did sensible things like cross stitch and solves the worlds problems, while the boys did less sensible things like drink a whole bottle of spirits, disturb the kind folk in our carriage and hang their bodies out the carriage doors without a care in the world for personal safety! Yes, apparently Vic and I are each marrying one of these fine specimens. Goodness me. Another lovely snap from Vic. Barry, Michael’s Dad, had arranged through one of his Sri Lankan staff members to have his friend meet us at the train station in Kandy. Mennica enters stage left. He’s young, full of smiles and seems happy to see us. Meanwhile the boys can barely string two words together. I almost die of embarrassment. Mennica’s cousin is waiting with a van in the car park and takes us to their family hotel where we have a choice of rooms. We go for the cheapest option – obviously. We’re backpacking and there ain’t no frills on this year long adventure. After settling in we head off to ‘The Pub’ for dinner and drinks. We’re craving some good local food but this place serves up a Sri Lankan take on western dishes. The pasta is good. The fish is not. Next morning we all set out for lunch of rice and curry. Here we are just before we tried it. Vic, so good with getting group photos taken! The curry yeilded mixed feedback. Mike liked it. Vic did not. Michael ordered a sandwich. I wish I’d ordered a sandwich. One of the curry dishes looked like cat jellymeat. Come on Sri Lanka. Where’s the good local food at? 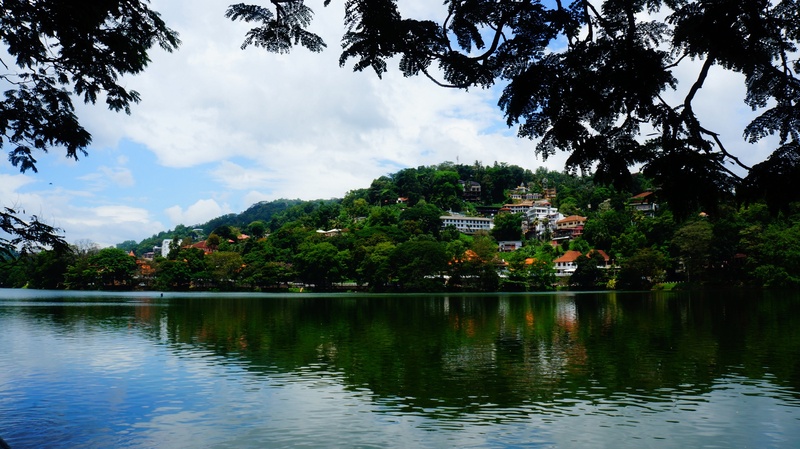 We spend the afternoon taking a leisurely stroll around Lake Kandy. We play a few rounds of ‘Log or Dog?’ where by you have to guess if what you’re looking at is a sleeping dog, or a log (a log could be an actual wooden log, or it could be a dead dog – sad but true). We saw some mutant hen things – ugh. And giant monitor lizards making sweet, sweet love. Either that or trying to kill each other. Vomit. Yuck, These things repulse me. We watched a man free hand carve a elephant out of bronze. He made one each for Vic and I and when we stacked them on top of each other they were almost identical. Now that’s impressive. That evening we had front row seats to a Sri Lankan cultural show. We knew it was going to be touristy and a bit naff, and it was, but it was still nice to see traditional costumes, dancing and songs. Maybe my favourite bit was towards the end when another tourist nearly walked, then almost fell on the burning coals they’d laid out for the performers. It’s mean to laugh, but he almost walked right through them and melted his shoes. Take your sneakers and jeans and get back on your tour bus buddy! That night Mennica invited us to his family home where we had sweet tea, cakes, biscuits and these deep fried, star shaped, spicy chip things. Mennica’s wife and baby were sick so we didn’t meet them but we did meet the rest of his family, his Mum, Dad, brother, sister and nephew, who were all so lovely, kind and polite. 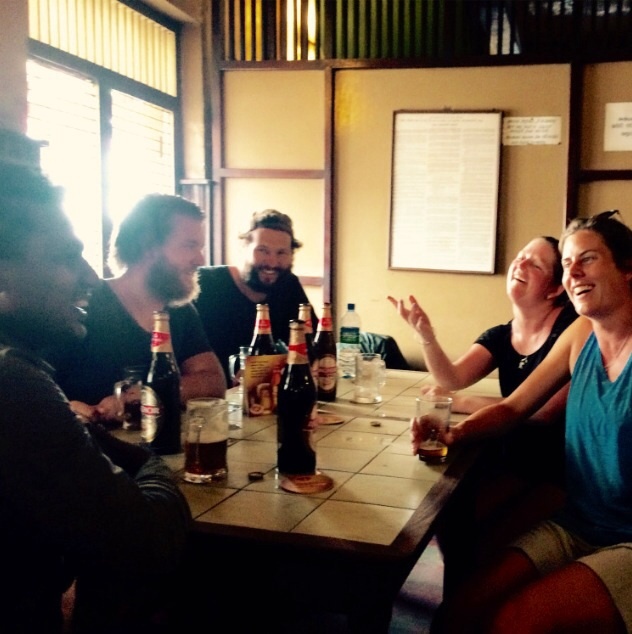 They gave us advice on our route around Sri Lanka and we learnt a bit about their lives. Mennica was fading before our eyes with a cold so we said thank you and good bye and left the family to rest. 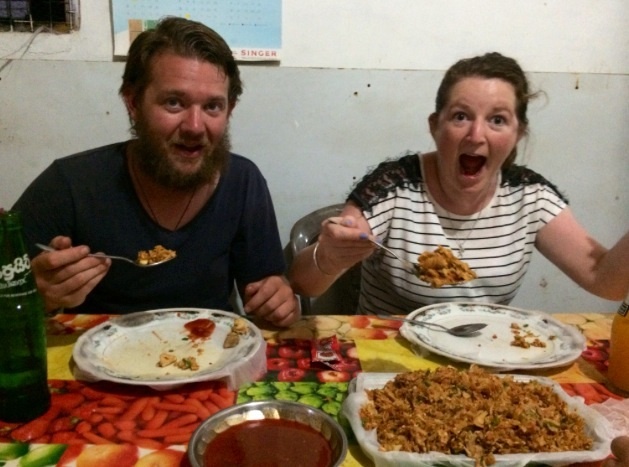 We finished the day with a meal of kottu – a local Sri Lanka dish of chopped up rotti and vegetables. I’m not a huge fan of kottu so I only had a small amount and topped up with spicy star chips. Mmmm. August 7, 2015 in Sri Lanka.